Home » Cottage News » The Cup that Cheers. The drink of choice of many Australian households in Australia in the late nineteenth and early twentieth century was tea. Tea was drunk first thing in the morning, in the afternoon, at ‘smoko’ time, and before bedtime. Making the tea correctly was a ritual in itself, before the advent of the teabag. Coffee has now taken over as the popular drink, but the paraphernalia associated with tea making and drinking remain: the teapot, the fine porcelain cups and saucers, the tea strainer and the tea caddy. The word ‘caddy’ is derived from the Anglo-Indian word ‘catty’, a unit of weight. Tea was grown on plantations in India and in Ceylon (now Sri Lanka) when those countries were part of the British Empire and widely exported to all countries of the Empire, including Australia. Loose leaf tea was generally kept in homes in tin tea caddies which held two or three pounds of tea, secure from the attentions of vermin or insects. In the cottage kitchen, we have three survivors of the time when families would enjoy a quiet cuppa together or on their own. 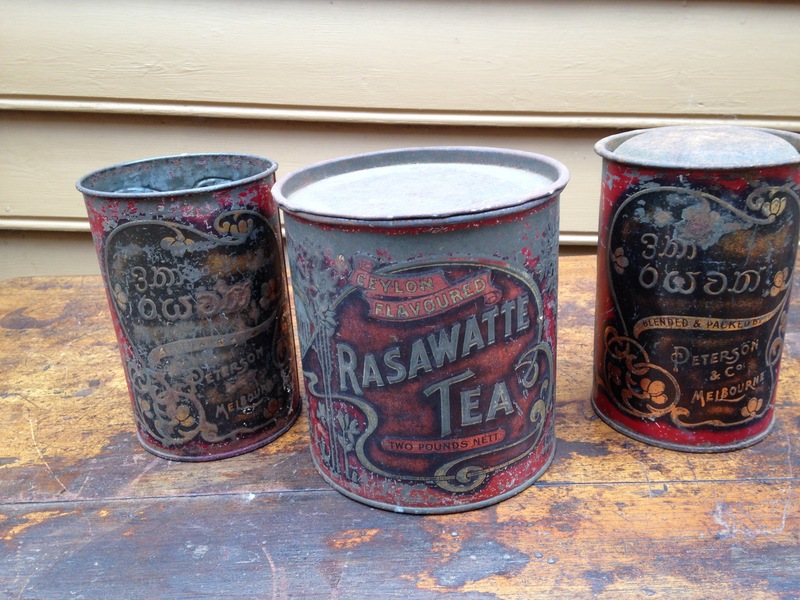 They are from the early 1900s, and once contained Ceylon flavoured Rasawatte tea, imported from Ceylon by Paterson & Co of Melbourne. Over the years, visitors from Sri Lanka have been delighted to see these souvenirs of their home country on the shelves of an Australian country kitchen.